State-run Korea Tourism Organization (KTO) will take part in Seatrade Cruise Global tradeshow coming up in Miami, Florida, on April 8-11, in hopes to pitch for cruising along Korean shores. Marking its 35th year, Seatrade Cruise Global is the world’s largest trade fair for the cruise industry. Nearly 700 business and organizations from 130 countries across the world participated as exhibitors and over 11,000 visitors attended the tradeshow last year. The Korean tourism board said it will run a booth in cooperation with tourism departments of Korea’s regional governments and port authorities to introduce features of cruise ports and attractions of the country at this year’s Seatrade Cruise Global. Separately, KTO plans to invite officials from the world’s leading cruise companies and tour agencies to Korea in June to give them a closer look to the country and its ports. It will be working together with local governments including Incheon, one of the country’s main port cities and adjacent to Seoul. The tourism board said it currently is developing recreational programs on Korean culture to be presented to 3,500 cruise travelers from Taiwan, who are scheduled to arrive in Korea through southern port cities of Busan and Yeosu in June. 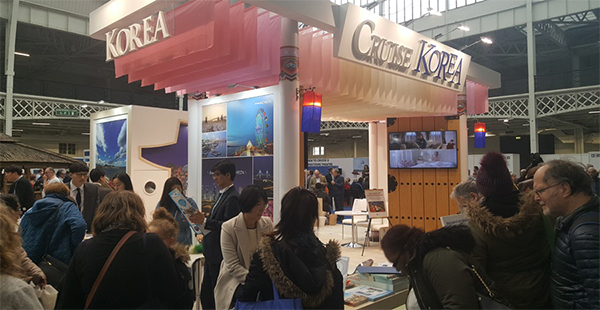 Earlier this year, KTO designated five of its overseas offices – New York, Taipei, Tokyo, London, and Frankfurt – as special outposts for promoting cruise travel to Korea.